When ACT UP took to the streets three decades ago, AIDS was a death sentence. Nobody knew what caused it and nobody knew how to treat it. Today, that is no longer the case. We have cutting-edge drugs that keep people alive. We have evidence-based models for prevention. We have global awareness of the epidemic. What we lack is the political will and compassion to reach out to the most marginalized among us and make sure that they have equal access to prevention and care. Ending AIDS is no longer a matter of science – it’s a matter of justice. Are for-profit companies persons entitled to First Amendment free religious exercise protections? Should the religious beliefs of the controlling stakeholders of your employing company dictate the healthcare you receive? Does providing healthcare to employees substantially burden a corporation’s religious freedom when that healthcare includes contraception coverage? Those are the questions the US supreme court will address in its review of two cases brought by companies who don’t want to pay for contraception under Obama’s healthcare law. The court’s answer could significantly alter the landscape of the American workplace and First Amendment rights forever – quite possibly in dangerous ways. The supreme court is hearing two of the 70 pending cases on the issue, one brought by the conservative Christian owners of a chain craft store with 15,000 employees of various faiths (the Hobby Lobby), and one brought by the Mennonite owners of a wood cabinet company. No one debates that the owners of these companies have sincerely-held religious beliefs. The question is whether, by mandating that the companies provide healthcare for their employees, the religious beliefs of the company are being violated. The fast food industry is notorious for handing out lean paychecks to their burger flippers and fat ones to their CEOs. What’s less well-known is that taxpayers are actually subsidizing fast food incomes at both the bottom – and top – of the industry. Zoë Carpenter: The End of Dark Money? We may think of Canada as our kinder, more generous neighbor, but a new study by the Harvard Immigration and Refugee Clinic indicates that the country’s has adapted a decidedly un-Canadian approach to refugees. The authors of the study write that Canada is “systematically closing its borders to asylum seekers and avoiding its refugee protection obligations under domestic and international law.” Canada’s policies are driving migrants and refugees to the United States, where they may encounter a detention system that “falls far below international law requirements.” According to UN standards, asylum seekers should not be detained at all, but the authors write that the United States repeatedly holds refugee applicants in custody for months, and even years, at a time. It’s hard to say which country comes across better-or worse-in the study. Since last year, when Canada passed a series of reforms to its refugee system, it has implemented various bulwarks to deter refugees from even arriving at the Canadian border. The Safe Third Country Agreement makes it almost impossible to enter Canada by land, as it prohibits asylum seekers who first set foot in the States to then apply for refugee claims in Canada (the agreement also applies to those who first arrive in Canada and then apply for US residency, but for geographic reasons, that scenario is far less frequent). Canadian Liaison Officers are now able enforce border laws from foreign posts-they’re stationed in forty-nine different locations-and intercept more than 4,000 people from boarding a plane or a boat to Canada each year. (As a point of comparison, US Customs and Border Patrol officers with a similar set of responsibilities can be found in just eight countries.) Canada has also been found, per the report, to outsource immigration enforcement to airlines and various private transport companies, meaning that asylum seekers don’t even have the opportunity to discuss their case with an immigration agent who may be more empathetic when, say, a passport is missing or a visa has been denied. Private companies, meanwhile, have been found to treat passengers inappropriately and to deny entry based on minor inconsistencies or gaps in identification papers. Canada’s approach is referred to as “pushing the border out”-or creating physical barriers far away from state lines, making the border more ephemeral yet more exclusive. Employees organize because they want to improve their working conditions and their pay. It’s effective to show them that joining a union is a quick way to reduce your pay to zero. There’s no reason to be subtle about it. Maybe that’s why it was easy for my husband to snap a picture [attached] of two Walmart people observing and photographing the demonstrators. Like the Pinkertons of earlier strike busting tradition, they have no reason to hide the fact that they have their eyes on you. But some of Walmart’s neo-Pinkerton surveillance capacities still surprised me. I don’t know if she got her information through sophisticated tapping of the organizers or merely following our twitter feeds. But it reminded me that I personally have more to fear from corporate espionage then NSA spying. Unless you’re a fundamentalist terrorist, (or an American who will never need a raise,) you probably do, too. 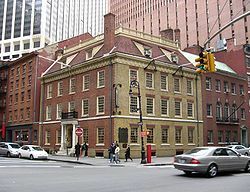 Fraunces Tavern is a tavern, restaurant and museum housed in a conjectural reconstruction of a building that played a prominent role in pre-Revolution and Revolution history. The building, located at 54 Pearl Street at the corner of Broad Street, has been owned by Sons of the Revolution in the State of New York Inc. since 1904, which claims it is Manhattan’s oldest surviving building. The building is a tourist site and a part of the American Whiskey Trail and the New York Freedom Trail. In August 1775, Americans took possession of cannons from the artillery battery at the southern point of Manhattan and fired on the HMS Asia. The British ship retaliated by firing a 32-gun broadside on the city, sending a cannonball through the roof of the building. When the war was all but won, the building was the site of “British-American Board of Inquiry” meetings, which negotiated to ensure to American leaders that no “American property” (meaning former slaves who were emancipated by the British for their military service) be allowed to leave with British troops. Board members reviewed the evidence and testimonies that were given by freed slaves every Wednesday from April to November 1783, and British representatives were successful in ensuring that almost all of the loyalist blacks of New York maintained their liberty. The building housed some offices of the Confederation Congress as the nation struggled under the Articles of Confederation. With the establishment of the U.S. Constitution and the inauguration of Washington as president in 1789, the departments of Foreign Affairs, Treasury and War located offices at the building. The offices were vacated when the location of the U.S. capital moved on December 6, 1790 from New York to Philadelphia. The Guardian has come under concerted pressure and intimidation designed to stop it from publishing stories of huge public interest that have revealed the “staggering” scale of Britain’s and America’s secret surveillance programmes, the editor-in-chief of the newspaper has said. Giving evidence to a parliamentary committee about stories based on the National Security Agency leaks from the whistleblower Edward Snowden, Alan Rusbridger said the Guardian “would not be put off by intimidation, but nor are we going to behave recklessly”. He told MPs that disclosures from the files had generated a global debate about the powers of state agencies, and the weaknesses of the laws and oversight regimes they worked within. “In terms of the broader debate, I can’t think of a story in recent times that has ricocheted around the world like this has and which has been more broadly debated in parliaments, in courts and amongst NGOs,” he said. Nick Pickles, director of Big Brother Watch, said: “Newspapers around the world, from the Guardian to the Washington Post and Der Spiegel, have done what our own parliamentary oversight committee and other oversight bodies failed to do: they exposed unprecedented surveillance being undertaken without the knowledge or approval of our elected representatives. “Spies spy, but they should not be able to write their own rules, exploiting woefully out-of-date legislation to collect information on millions of innocent people. Yesterday the UN special raporteur on counter-terrorism and human rights, Ben Emmerson, announced he was launching an investigation into the surveillance programmes operated by GCHQ and the NSA. In a four part series on RAI with Paul Jay, Sen. Bob Graham (D-FL) explains why he persists in making the case that facts directly connect the Saudi government with 9/11 conspirators. “So when I got involved particularly at the national level in the U.S. Senate and saw some of the things that were happening-which were not theoretical; they were things that I was dealing with on a very day-to-day hands-on basis that were contrary to that view of what was the presidency-it was a very disillusioning experience. And maybe some of the comments that I make in the book Intelligence Matters reflect that path to disillusionment,” said Graham. “Everything that the federal government has done since 9/11 has had as one of its outcomes, if not its objectives-and I believe it was both outcome and objective-that the Saudis’ role has been covered,” says Graham. “All three of them used almost the same word-implausible-that it is implausible that that could have been the case. Yet that has now become the conventional wisdom to the aggressive exclusion of other alternatives,” says Graham. Former Senator Graham says that a new inquiry into 9/11 should be launched to ask whether the 19 hijackers acted alone, the extent of Saudi involvement in the attacks, and why the US concealed evidence of a support network for the hijackers. Graham served as the co-chair of the 2002 Joint Congressional Inquiry into 9/11. A 28-page chapter in the final report detailing Saudi involvement in the financing, support, and execution of the attacks on the World Trade Center was redacted by the FBI. The FBI also withheld information about the support networks for several of the 9/11 hijackers located through the United States, says Graham. “You don’t have everybody moving in the same direction without there being a head coach somewhere who was giving them instructions as to where he wants them to move,” said Graham.